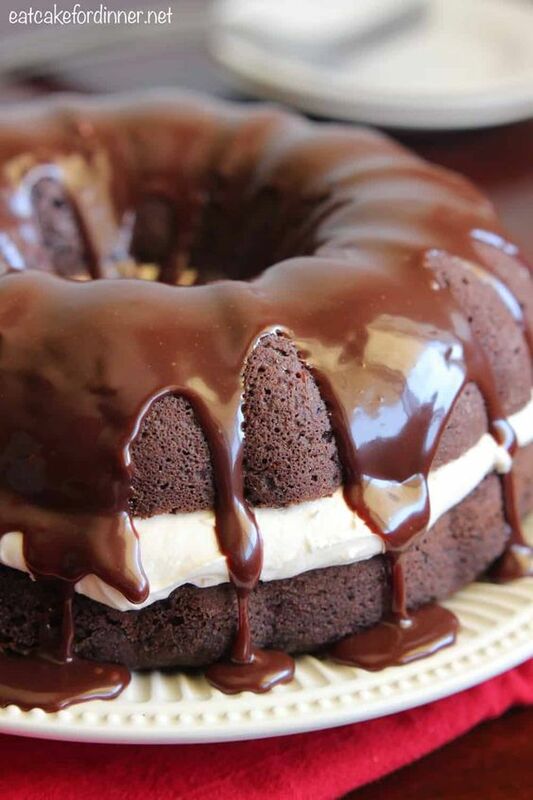 A dense fudgy cake with a soft and pillowy marshmallow creme filling and creamy chocolate ganache. For the Chocolate Ganache: Place chocolate chips in a small bowl; set aside. Microwave whipping cream in a small, microwave-safe, dish until it starts to bubble. Pour hot cream over chocolate chips and allow to sit for 5 minutes. Stir together until smooth and creamy. If chocolate chips aren't completely melted. Place in the microwave and heat, stirring every 10 seconds until mixture is smooth and chocolate is melted. Allow to cool for 10 minutes or until slightly thickened and pour over cake. Store cake in the refrigerator. Bring to room temperature before serving.